The Burritos' favorite ride in Kennywood was the Whippersnapper. They came c back on this one three to four times before we left. According to Kennywood's website's info, Whippersnapper is a smaller version of the large Mangles Whip found in the Lost Kennywood area of the park. The Whippersnapper was one of the first four Kiddieland rides Kennywood purchased in 1924. It is still a favorite today. They look like they are really enjoying themselves! What fun! Kids love motion and mechanical rides. Not too fast or rough for the little ones, but giving hem a taste for faster amusement park ride later. Now it is a cute view of fun-loving kids! Lots of great rides there! I thought the reference was to the kids, not the ride! Haha, you always crack me up Roger. It's called whippersnapper because at each end they cart whipped in a snap lol. Looks like they were having a great time, but when I was there age, I wasn't a fan of rides that went around and around. Oh well, to each their own! What fun your whipper snappers had on the whippersnapper! It certainly looks like fun! I remember my kids riding a ride just like that at a local amusement park when they were young. My daughter, especially liked it and would ride it as many times as we would let her. Looks like this is a winner! Love the sheer thrill of the ride captured in the last photo! Looks like you guys are always having fun. I can't believe that the whippersnapper is a 1924 item. Amazing. yay! rides are so much fun and Daddy is watching too which is more safe and adventure to do :-) Dropping by from Mommy Moments. That looks like so much fun! Glad to be here via Mommy Moments. Do drop by when you have the time. Thanks for joining TT last week, sis! 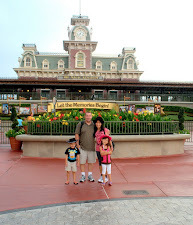 Please join again; this week's linky is now up at http://www.3travelholics.com!